朱珍妮, 臧嘉捷, 汪正园, 邹淑蓉, 贾晓东, 郭常义, 马立芳, 许东, 吴凡. Zhu Zhenni, Zang Jiajie, Wang Zhengyuan, Zou Shurong, Jia Xiaodong, Guo Changyi, Ma Lifang, Xu Dong, Wu Fan. Zhu Zhenni, Zang Jiajie, Wang Zhengyuan, Zou Shurong, Jia Xiaodong, Guo Changyi, Ma Lifang, Xu Dong, Wu Fan. 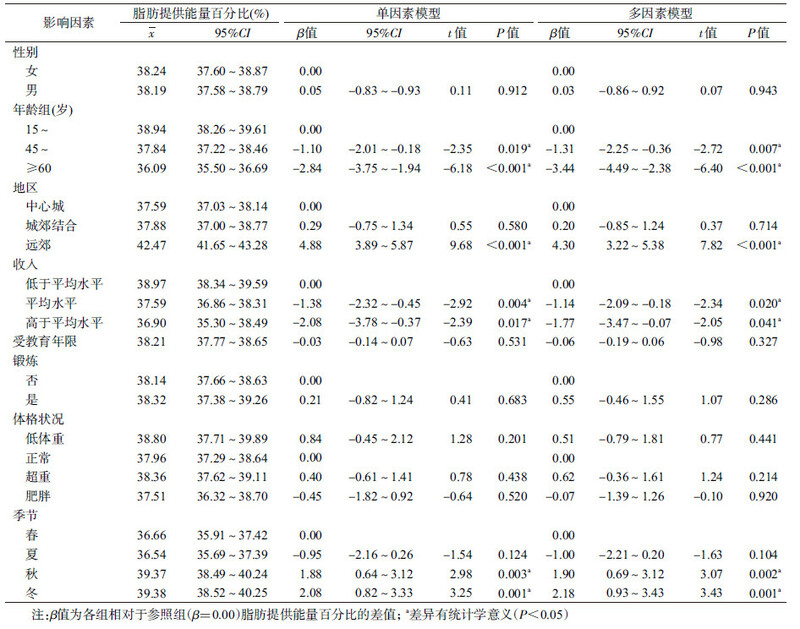 Dietary pattern and its seasonal characteristic in residents of Shanghai, 2012-2014[J]. Chinese Journal of Epidemiology, 2018, 39(7): 880-885. Abstract: Objective To analyze dietary pattern and its seasonal characteristic in residents of Shanghai. Methods A representative sample was surveyed and followed up in four different seasons during 2012-2014. Information of food consumption was collected by 3-day 24-hour dietary recall and condiments weighing method. 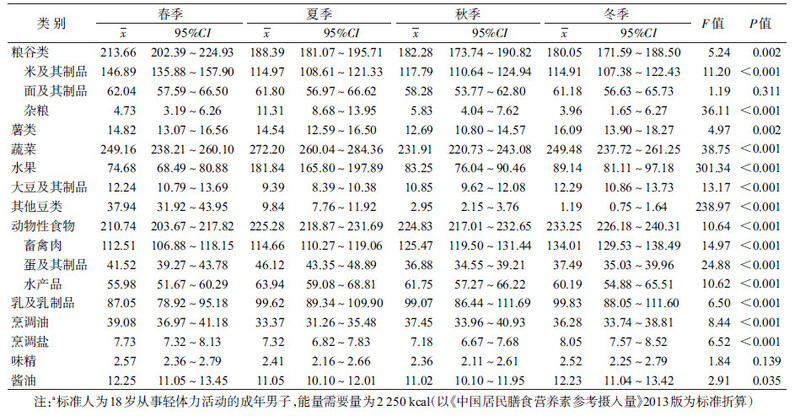 The intake of energy and macronutrients were calculated according to the Chinese Food Composition Table. Results Annual average daily intake was 191.09 g for grain, 250.69 g for vegetable, 107.23 g for fruit, 223.53 g for animal food, 96.39 g for dairy products, 11.19 g for soy bean and its product, 36.54 g for cooking oil, and 7.57 g for salt. Significant differences were observed in food consumption among different seasons (P < 0.05). Annual average daily intake of energy was 2 048.70 kcal, carbohydrates was 241.04 g, protein was 82.35 g, fat was 85.99 g and proportion of energy contributed by fat was 37.99%. Different seasons, age, residential areas, and income were influence factors for food consumption (P < 0.05). Conclusions Energy intake was adequate in residents of Shanghai. Unhealthy dietary pattern, including high proportion of fat and consumption of cooking oil and salt (lower than average intake of large cities, but higher than recommendation), was observed. It is necessary to take appropriate nutrition intervention, and future researches on dietary intake should consider seasonal influences. 葛可佑. 中国营养科学全书[M]. 北京: 人民卫生出版社, 2004: 1275–1283. Ge KY.An overview of nutrition sciences[M]. Beijing: People's Medical Publishing House, 2004: 1275–1283. 杨月欣. 中国食物成分表 2002[M]. 北京: 北京大学医学出版社, 2002. Yang YX.China food composition 2002[M]. Beijing: Peking University Medical Press, 2002. 杨月欣. 中国食物成分表 2004[M]. 北京: 北京大学医学出版社, 2004. Yang YX.China food composition 2004[M]. Beijing: Peking University Medical Press, 2004. 中国营养学会. 中国居民膳食营养素参考摄入量(2013版)[M]. 北京: 科学出版社, 2014: 83–97. Chinese Nutrition Society.Chinese dietary reference intake (2013)[M]. Beijing: Science Press, 2014: 83–97. 中国肥胖问题工作组数据汇总分析协作组. 我国成人体重指数和腰围对相关疾病危险因素异常的预测价值:适宜体重指数和腰围切点的研究[J]. 中华流行病学杂志, 2002, 23(1): 5–10. 刘建华, 金水高. 复杂抽样调查总体特征量及其方差的估计[J]. 中国卫生统计, 2008, 25(4): 377–379. 邹淑蓉, 施爱珍, 高围溦, 等. 上海市居民膳食结构变化趋势分析[J]. 上海预防医学杂志, 2006, 18(7): 311–314, 319. 汪源, 施燕, 吴春晓, 等. 上海市全民控盐干预效果评价——居民用盐量的变化[J]. 环境与职业医学, 2015, 32(1): 38–42, 46. 常继乐, 王宇. 中国居民营养与健康状况监测2010-2013年综合报告[M]. 北京: 北京大学医学出版社, 2016: 33–41. 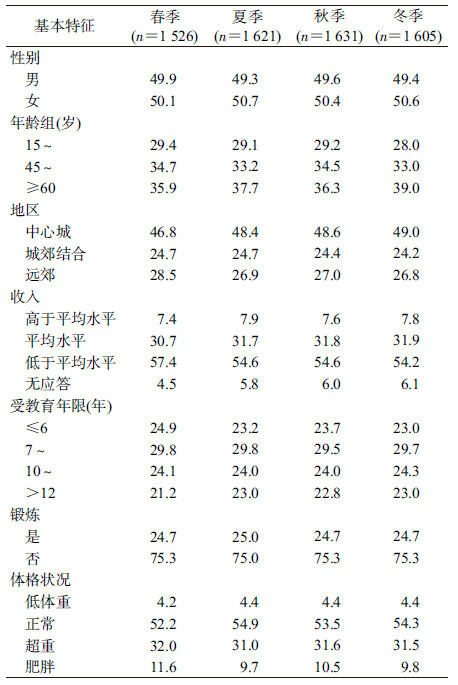 Chang JL, Wang Y.2010-2013 Report of Chinese nutrition and health survey[M]. Beijing: Peking University Medical Press, 2016: 33–41. 中国营养学会. 中国居民膳食指南2016科普版[M]. 北京: 人民卫生出版社, 2016: 11–270. Chinese Nutrition Society.Chinese dietary guidelines (2016)[M]. Beijing: People's Medical Publishing House, 2016: 11–270. The General Office of Shanghai Municipal People's Government. The general office of Shanghai Municipal People's government issued the notice on the implementation of China's Food and Nutrition Development (2014-2020)[DB/OL]. (2015-06-11)[2017-12-01]. http://www.shanghai.gov.cn/nw2/nw2314/nw2319/nw12344/u26aw44050.html. 徐继英, 姚海宏, 严青华, 等. 上海市15岁以上人群超重率和肥胖率的现状及发展趋势[J]. 中国慢性病预防与控制, 2014, 22(2): 170–173. Xu JY, Yao HH, Yan QH, et al. The present status and development trend of overweight and obesity in residents(≥ 15 years old) of Shanghai[J]. Chin J Prev Control Chron Non-Commun Dis, 2014, 22(2): 170–173. van Staveren WA, Deurenberg P, Burema J, et al. Seasonal variation in food intake, pattern of physical activity and change in body weight in a group of young adult Dutch women consuming self-selected diets[J]. Int J Obesity, 1986, 10(2): 133–145.